Just occasionally, I hear distant horses’ hooves in the street outside when I am sitting writing at my desk in Spitalfields. It always causes me to stop and consider this evocative, once familiar sound, that echoes down through the centuries. When horses were the primary mode of transport, there would have been hundreds of stables in the City, but today there is only one. 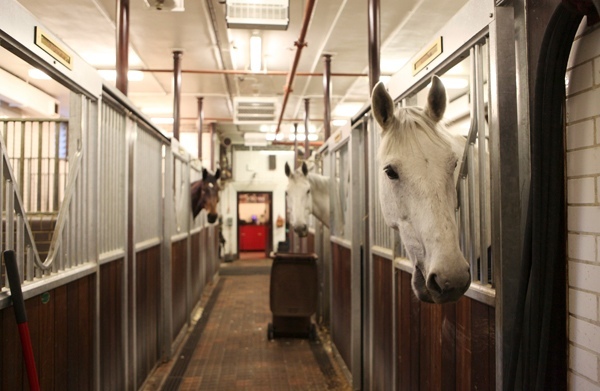 So yesterday, I decided to follow the sound of the hooves back to their source in Wood St and pay a visit to the last stable, the home of the City of London Mounted Police – and Spitalfields Life contributing photographer Patricia Niven came along with me. 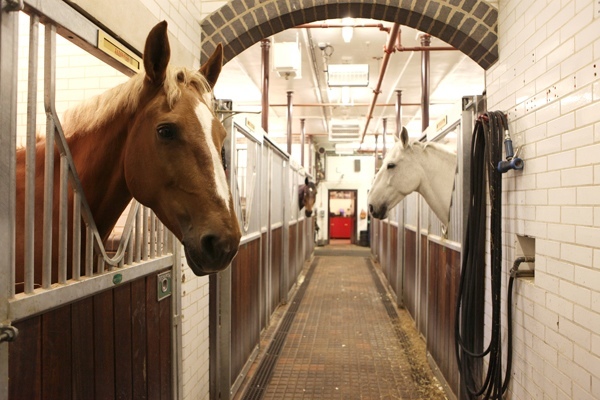 Passing among the shining glass towers of the City and then entering Wood St Police Station, we were ushered behind the desk, past a sign that said “Level of threat: normal,” down a passageway, through a courtyard and into the stables where the magnificent beasts are kept. 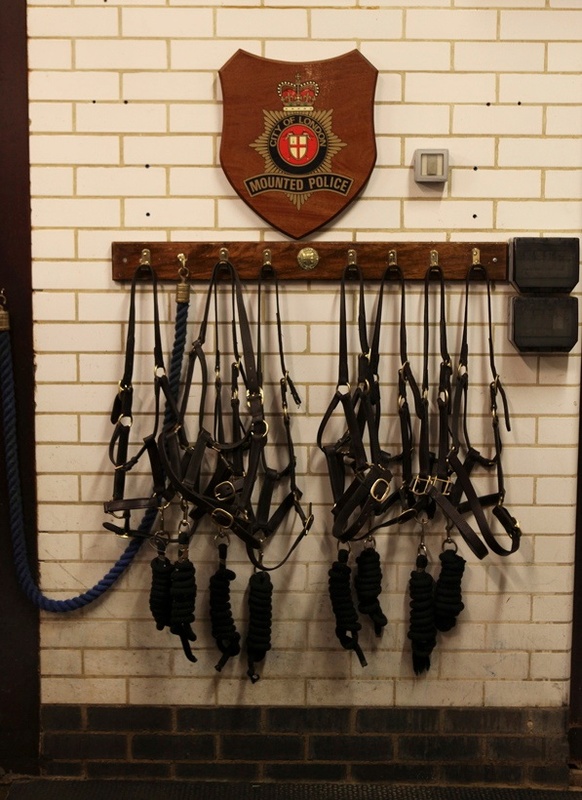 Leather harnesses hung from the walls, straw was scattered upon the floor and the acrid smell of the farmyard prevailed here in this quiet enclave, a world apart from the corporate financial culture that surrounds it. 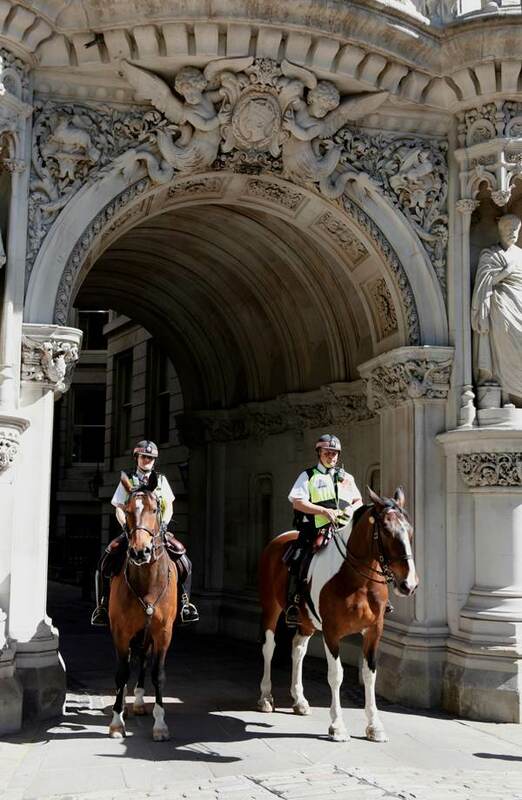 These are the last working horses in the City, out on the street in pairs for four hours at a stretch as they undertake patrols three times a day. 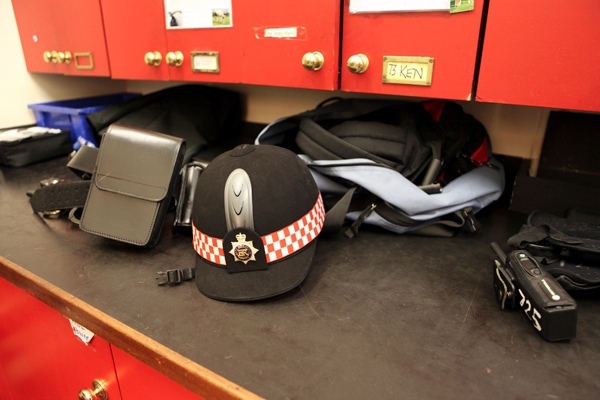 Exchanged fortnightly, the troupe of ten is divided equally between here and Bushey Park where they get to run free and where training takes place. 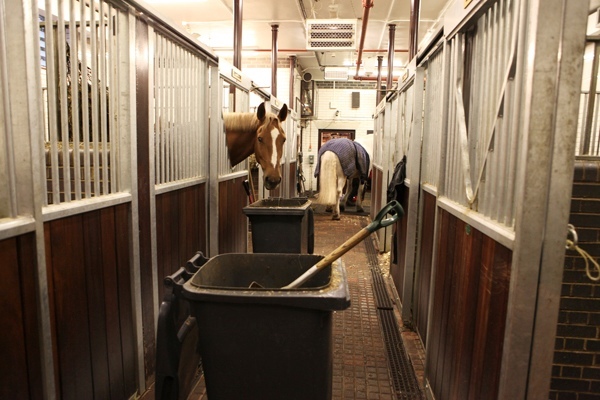 Mounted police officers double up as stable hands, cleaning kit and mucking out, grooming and feeding their charges. 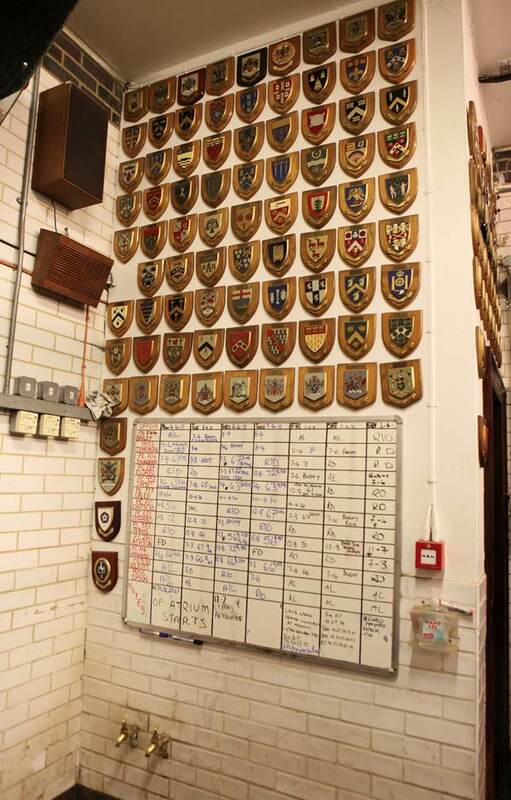 And, consequently, the stable is a scene of constant activity from seven each morning, when they arrive to wake the horses before setting out on the first patrol at eight thirty. “I never envisaged, when I joined the police, I’d end up riding a horse,” admitted Sergeant Nick Bailey, greeting us eagerly, “I joined the police to ride motorbikes, but I suppose you could say I found a different horsepower.” Yet, in spite of his alacrity, Sergeant Bailey is a passionate horseman who grew up riding and competed in equestrian events before the demands of police work caused him to choose between his career and sporting endeavours. 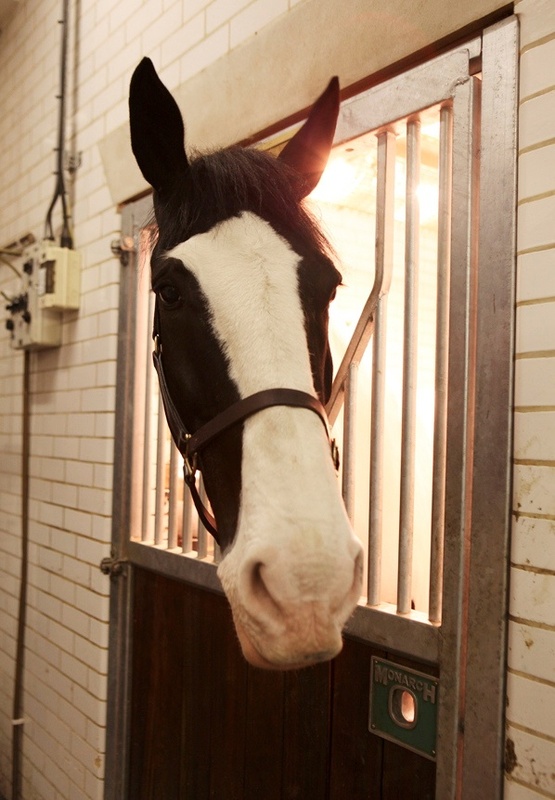 Now with thirty years service behind him, he came to the City of London to take charge of the mounted police just twelve months ago from Bridgend in Wales, where he set up the equestrian department. “My wife and family are still in Wales, I go back every third week” he confessed with a shrug, yet he was keen to outline his busy year that began with the Lord Mayor’s Show and included the student protests, an English Defence League demo in Luton, football matches at Watford and Arsenal, and a Heavy Metal festival. 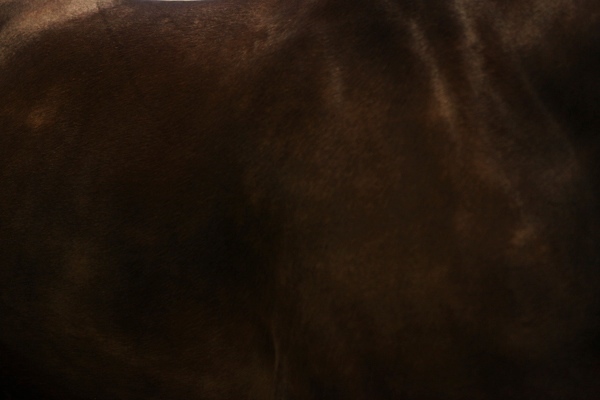 Sergeant Bailey introduced his four horses in the stalls that morning. Trader, a powerful white stallion quivering with life, reached over to scrutinise us while Little Dave, a smaller dark horse, eyed us from a distance – weary from the traffic patrol that morning. 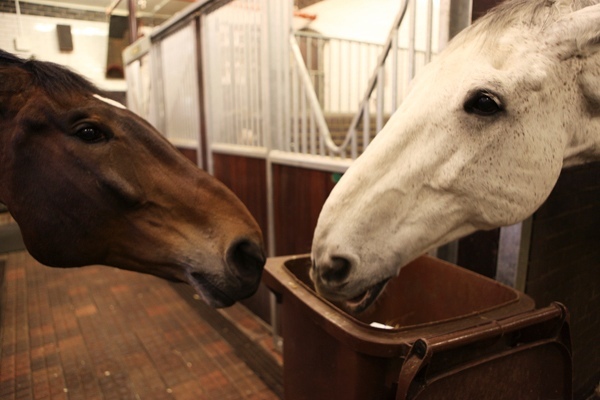 Opposite, Finn, the oldest horse, with ten years service, stood composed and dignified and then Roxie, the only mare, pushed her glossy striped head over the gate to greet us enthusiastically. i love the frame full of shiny brown coat. Yet another great article thanks. One of the highlights of my youth was hitching a ride on a horss and cart. I remember, more than 55 years later the different view of familar streets in Hackney. 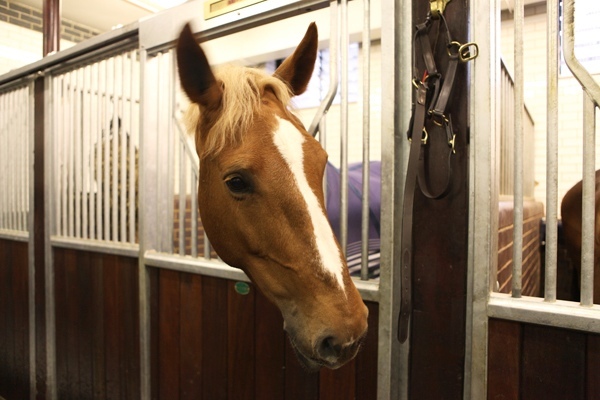 The horse was stabled in Blanchard Road, London Fields. It’s so good to see this tradition continuing. I remember we were burgled when I was about 8 (in the mid 1950′s) and living in Victoria. 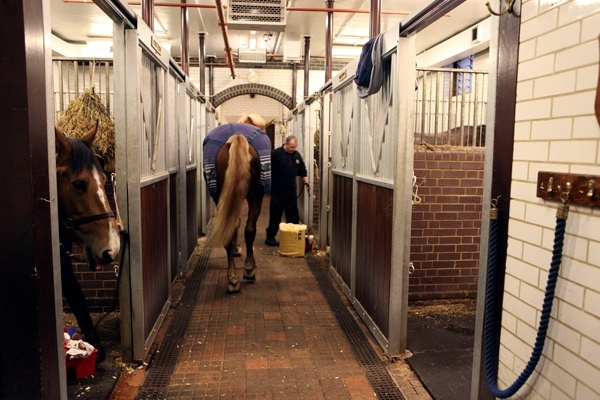 It was almost worth it, because the Police took me round the stables they then had at Rochester Row Police Station. 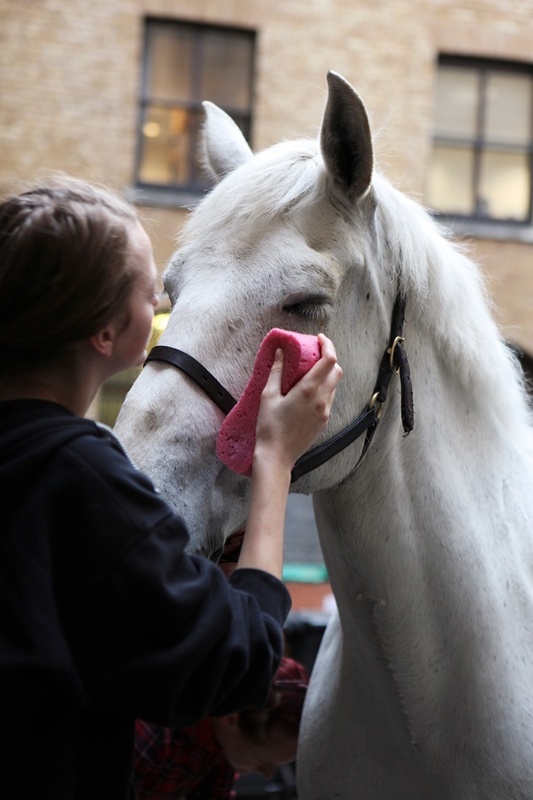 A city child, it was my first close encounter with the sight and smells of the stable, and I was very impressed with those horses – so huge, strong, and yet, to me, gentle and friendly. Some beautiful pictures of beautiful animals. 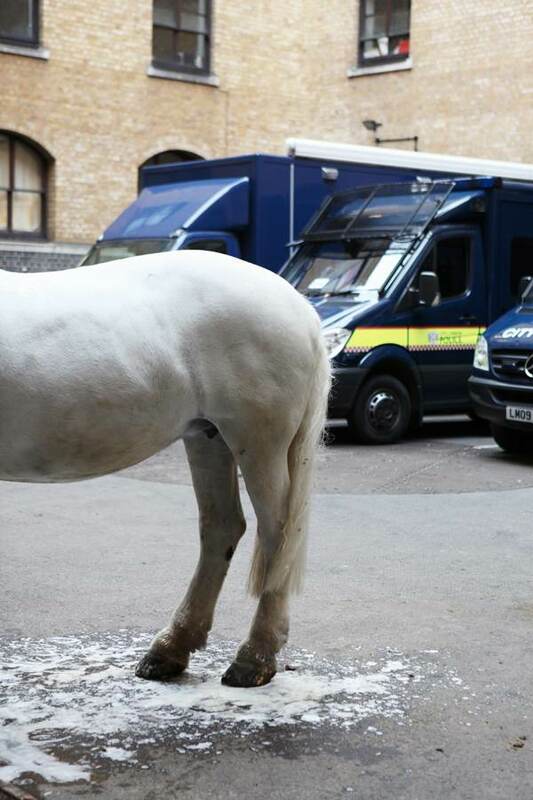 I hope the tradition of using police horses never dies out altogether. When I’ve seen them used to control large crowds, I’ve noticed that even the rowdies who may not think much of human authority give the horses a certain amount of respect. To paraphrase Neil Young, long may they run! 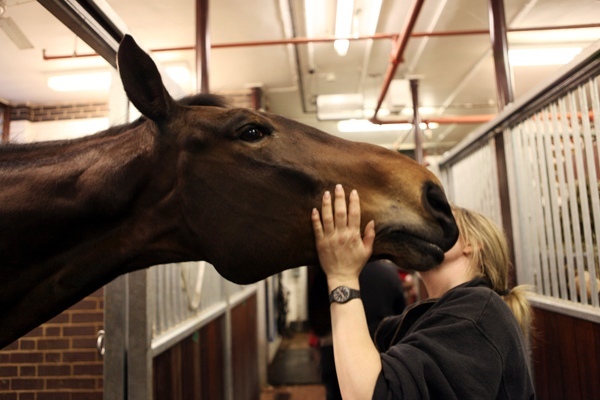 A lovely piece – police horses are real heroes and have to undergo very rigorous training. I very much doubt that the grey is a stallion, especially with a mare in the squad! 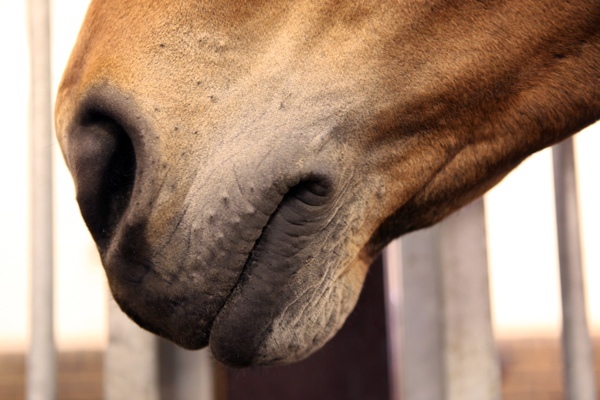 A mature stallion takes very sensitive handling, and they are usually only kept for stud duties. 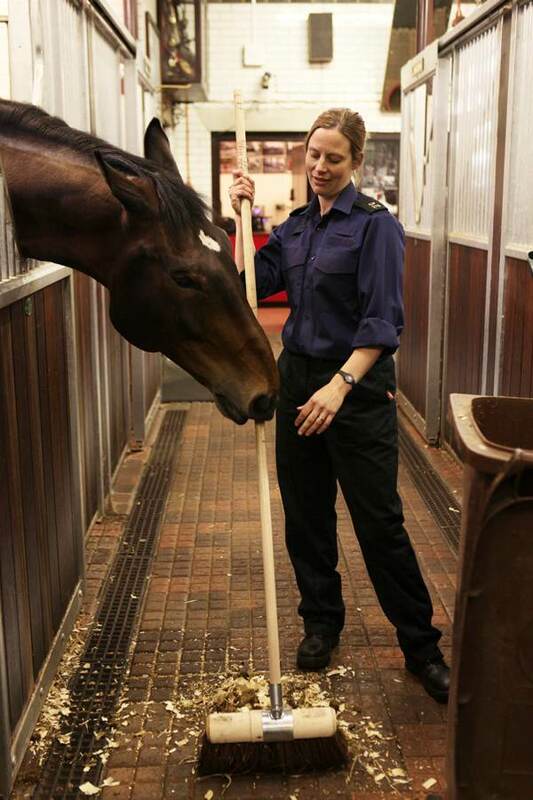 I’m pretty sure the police would use geldings (castrated horses, as most males are quite early on) – you would not risk working a stallion on public duties. Hello I’m Tiziano and I would like to work in contact with Horses. How can I do? I have an 8 year old daughter – who every Saturday helps out at pony sanctuary – she mucks out horses and ponies from 9-3pm come rain or shine. She has a one hour lesson as part of that. 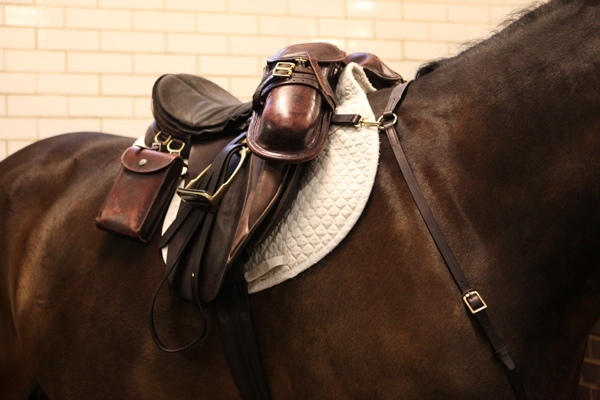 She has it in her heart to one day become a mounted police officer. I am wondering if there is any chance she could visit your stables one day, even for a few hours to meet the horses and a police officer.